Went out with Piner on a hunt and seek mission for more bottom spots. Goal was to find snowy and tile. Got a late start and headed south looking for birds or something fishy. Did not see much until we got to about 700’ and came upon a few huge mats. We trolled by them, jigged a couple of them and nothing but 1 small mahi. Us and three other charter boats circle these mats but nobody home. Decided to hit the hump to get some fresh bonitos for bait. Stopped about 2 miles north on a rip with birds. 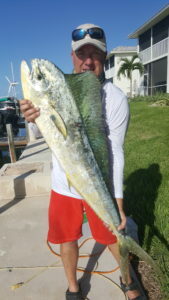 We got a BFT and a nice mahi. With meat in the box we headed back toward to hump for bait. Very few boats, some birds but no fish. We trolled around and could not even get a skippy. Had a couple of knock downs and one good bite but it cut the line. I had a couple of frozen bonitos so we gave up and went to the bottom grounds. Got a couple of good drifts in, found some nice spots then a seal blew on port steering. Picked up lines and pointed it towards the creek. Was interesting driving a boat with almost no steering at 30mph. Those World Cats are a beast even with a part failure. Finally got it on the lift and washed down. Marty’s marine was in the area stopped by at 6:30 to see what it was going to take to fix it. Hopefully he will get it going tomorrow. Overall a rough day but learned a little more and had another great day fishing in the Florida Keys.